Improper brushing, flossing, and absence of regular medical checkups may lead to tooth decay or disease. Then again, you may be born with defective teeth or protruding teeth, which look ugly. Sometimes, injuries cause teeth to go missing or become broken. In these kinds of scenarios, it is best to go in for dental implants. They are nothing but replacements, which feel like, appear and function just like your natural teeth. Constructed from titanium, they represent tiny posts that may be fitted into the jawbone, wherever there are gaps caused by missing teeth. Soon enough, the bone and titanium form a strong friendship, permitting the planting of artificial or prosthetic teeth. What are the Various Types of Implants? The Endosteal (inside bone) type of implant is preferred by patients with dentures or bridges. The dentist may use blades, screws, or cylinders as fixtures within the jawbone. Every implant is capable of holding more than one artificial tooth. The Sub-Periosteal (on bone) implant comprises of metallic posts that are placed on top or above your jawbone. However, they protrude from under your gums. These protrusions help to hold the prosthetic teeth in place. It is extremely suitable for patients with low bone height. 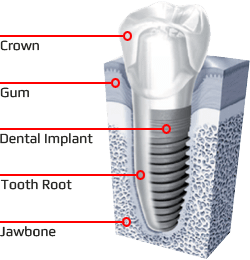 Dental implants are apt for people of all ages, provided their general oral health is good. This means that, as a patient, you must have sufficient bone material within your jaw, for supporting the implant. Then again, your gums must be free of decay or periodontal disease. As mentioned earlier, if your oral region is free of serious decay or disease, you are welcome to go in for a dental implant. See what the prosthodontist says when you inform him/her of your smoking habits, or pre-existing medical conditions and medications. Imagine the tremendous boost that your self-esteem and confidence will receive when the aesthetic appeal of your face remains undestroyed via dental implants. Bridges and dentures cause the recession of gums; you will have no such issues with replacements. Dental implants do not demand alterations or support from neighboring teeth. Above all, you may say goodbye to wobbly dentures, messy glues, bad oral health and ugly looks forever. To begin with, your prosthodontist will surgically fix a tapered or cylindrical titanium post into your jawbone. Over a period of weeks or months, the post will fuse with your natural jawbone, forming a strong foundation for the setting of artificial teeth. Go about your everyday activities without fear, but keep your dental appointments. Once you are healed, an abutment or small connector will be placed on top of this fused implant. This will hold the tooth/teeth in place. Finally, the prosthetic replacements are fitted in place. You may require a lone tooth, or dentures/bridge comprising of multiple prosthetic teeth. Just like natural teeth, your dental implants will require daily brushing, flossing and cleaning. Ensure that you adhere to your follow-up appointments regularly, for implants are subject to wear-and-tear too. Thus, with dental implants, you will be able to speak, laugh, and eat, etc. with confidence!